The West Coast Electric Highway—one of the longest electrified corridors in the world—is demonstrating that electric vehicles are here for the long haul. In 2008, the West Coast states of California, Oregon, Washington and the province of British Columbia all recognized a simple, but alarming fact: western North America was experiencing significant population growth. That meant tens of thousands more vehicles on the road, producing more climate change-causing greenhouse gases and lowering air quality across the whole region. To prepare for that outcome, they laid out a shared vision in two 2008 agreements for an alternative fuel corridor along I-5 and Highway 99 to promote the use of biofuels, hybrids, electric or zero-emission vehicles, and hydrogen-fueled vehicles. Federal funding from The EV Project helped kickstart the effort and the first charging station on the West Coast Electric Highway was opened in 2011. “The focus is to give electric vehicle drivers a unique and consistent driving experience,” says Tonia Buell, a project development manager with the Washington State Department of Transportation. Now boasting thousands of chargers, the West Coast Electric Highway makes it possible for an intrepid zero emissions vehicle (ZEV) driver to drive from Baja California to British Columbia, charging as needed at stations spaced every 25-50 miles along the highway. Buell, a proud ZEV driver, has been a part of the West Coast Electric Highway project since its earliest days. She identifies new station locations, forms partnerships with utilities and private companies, and creates unified branding and signage up and down the West Coast. Buell dreams of the highway system becoming the Route 66 of electric infrastructure—an iconic road for fossil-fuel free travelers. The now completed corridor supports both ZEV commuters in metropolitan areas and long-distance road-trippers. Now other segments of highway branching off from the main north-south route are being built out. Annette Pitts, a Wenatchee, Washington, resident and the executive director of a small tourism nonprofit called the Cascade Loop Association, is happily surprised not just by the number of electric vehicles she’s begun to see on a 440-mile electrified stretch of highways in eastern Washington that was finished in 2014, but also by the number of different state license plates. “It used to just be Washington state, people probably within Seattle. Now I see people driving down from Canada, people from California, people from Texas, and the Midwest even,” Pitts says. Charging stations on the highway are all within a mile of the major roads, often at private businesses such as shopping malls or gas stations where drivers can access bathrooms, food and other amenities. On the road, signs and a smartphone app direct drivers to the nearest charging station. A driver pulls in, plugs in, and in about 30 minutes can be back on the road. Electric cars still make up only a small percentage of all vehicles on the road in the U.S.—just over 1 percent nationally, compared with about 5 percent in China and a whopping 39 percent in Norway. But that number is on the rise. At the end of 2017, 27,858 plug-in electric vehicles were registered in Washington, a more than 150 percent increase over the previous 18 months. The state has a goal of registering 50,000 such vehicles by 2020. It’s a goal that Buell is confident will be exceeded, especially with the introduction of a new wave of more affordable high-mileage electric vehicles such as the Nissan Leaf and Chevrolet Bolt, which can travel 150 and 238 miles, respectively, on a single charge. The cost of charging a ZEV also is typically 60 percent cheaper than filling a gas tank,according to the U.S. Department of Energy, which uses “eGallons” to compare the cost of charging up a vehicle to that of filling a similar model up with gasoline. As of July 19,an eGallon cost an average of $1.17, versus $2.84 for regular gasoline. In Washington, where the cost per eGallon is the lowest in the country, the fuel cost savings is the highest in the nation, 74 percent, partly because of the state’s use of hydroelectric power in its energy grid. Electric car owners also can expect to pay less in repairs over the life cycle of their vehicle. On a macro-economic level, this means that money is spent on other things that benefit the economy, and it insulates states and communities from the impacts of an oil price spike. California is even further along in the electrification process than Washington. Zero-emission vehicles make up almost 5 percent of the California market, with more than 410,000 on the road at the end of 2017. To keep pace with the state’s carbon reduction goals, Gov. Jerry Brown announced $2.5 billion in investments over the next eight years and a target of putting 5 million ZEVs on the road by 2030. The West Coast Electric Highway is funded by private-public partnerships and fees on vehicle registration and eGallons. But it’s likely to become more expensive as strategic charging corridors get upgraded to keep up with the next wave of even-faster-charging electric cars. Most charging stations in use now are 50-kilowatt systems, but the next wave of vehicles will be able to take advantage of 100-kilowatt to 150-kilowatt stations, reducing charging times to 15 minutes or less. “Everyone’s pointing to each other, asking who’s going to pay for those power upgrades,” says Zach Henkin, deputy director of Forth Mobility, a trade organization for the electric vehicle industry. Henkin also believes that with the wide variety of vehicles that will be hitting the road shortly, charging technology is now evolving faster than utilities can adapt, creating a misalignment in their business models. Buell says challenges faced in developing cohesive electric infrastructure are similar to the challenges faced when automobiles first came into use at the beginning of the 20th century, when “filling stations” were installed in or just outside of major city centers, often with wholesalers supplying fuel in horse-drawn tank trucks. Seattle got its first gas station in 1907, and in 1914, a chain of 34 stations was opened along the West Coast by Standard Oil of California. The development of functional Interstate corridors was a long collaborative process involving both private and public funding sources. That is what it will take to keep electric highways advancing both in capability and geographic spread. In 2011 when the first charging station of the West Coast Electric Highway was installed, the Department of Energy counted 687 charging stations throughout the United States. As of July 1018, there are now about 52,000 public charging stations and outlets. To put it in perspective, that’s more than one-third the number of gasoline stations—about 150,000—in the entire country. Many electric charging stations received government grants and help from private investment and utilities to get set up. 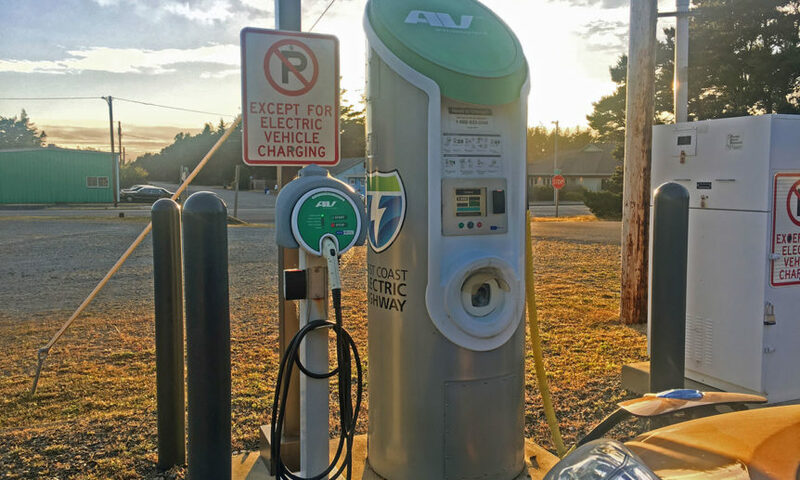 Others, like the brand-new charging stations in Washington’s Tri-Cities area and the city of Ellensburg, were financed by the state’s annual $150 electric vehicle fee. While the landscape of funding an electrical overhaul on automobile transportation is certainly still in flux, one of the largest, and most unexpected funding sources for electric infrastructure has been Volkswagen’s settlement funds, after the company was caught fraudulently reporting its diesel vehicles’ carbon emissions in 2016.Volkswagen is required to pay $2 billion over the next 10 years to fund zero emission vehicle infrastructure, which includes prioritizing charging infrastructure in low-income and disadvantaged communities. Those funds are being distributed across all 50 states through Electrify America, the program created to help manage those funds. In Washington, Buell believes the settlement could cover 10-20 percent of the state’s electric infrastructure needs over the next decade. Buell now spends much of her time talking to governments and private companies around the world, from the East Coast of the U.S. to Europe and India. One day not too far from now, she says, these other electric highways will connect up to the West Coast Electric Highway. “We are planning our highway charging for the masses and we need a lot more chargers and a lot more funding,” Buell says. This was written by Erika Lundahl for Yes Magazine. To see the original version of this article, please click HERE.